Lifebridge Sanctuary has been a haven for numerous retreats we've held through the Hero's Journey Foundation and Sacred Living Project. The Sanctuary goes beyond hosting, to significantly contributing to our events. The building and beautiful natural surroundings support the deep reflection, meditation and conversation vital to our work. The careful attention given by the Lifebridge Foundation founders and staff to world service and sustainable living is felt by all of our participants and offers further inspiration to our own work aligned with those values. 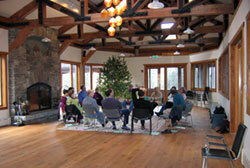 The Sanctuary offers a rich variety of distinctive spaces for group gatherings, many with spectacular views. Our 1800 sq. ft. Upper Room offers panoramic mountain views, a large stone fireplace and versatile seating options that will accommodate large gatherings. We also have break-out areas including CedarHeart Lodge - a fantastic stone walled room with fireplace, and The Stone House Library with a piano and an extensive collection of books on spiritual and social transformation. Check out the Floor Plans. The Upper Room is the main meeting room for most groups. 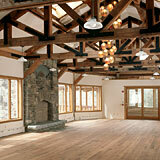 Surrounded by large windows, guests are treated to panoramic views of the Catskill Mountains. The hand crafted floor to ceiling stone fireplace supplies abundant radiant heat in the winter and is a visual treat in all seasons. Vertical support beams are hand picked hard wood trees from the land and the wide plank oak floor supplies a natural beauty and warmth. The open ceiling is graced with a hand made chandelier and a custom designed stain glass window skylight, both made by local craftspeople. Superb acoustics afford versatility for large or small groups making the Upper Room the perfect environment for group meditation, yoga and general meetings. Dimensions -60' x' 30' 1800 sq. ft. will accommodate up to 60 seats in the round, or 80 seats theatre or horseshoe configuration. The Stone House Library is the original 1772 Dutch stone house, fully restored and enhanced with 21st century green building features. Hand hewn reclaimed beams and stone pillars from a nearby ancient ruin invite guests to relax and enjoy the extensive donated library of books on spiritual and social transformation. 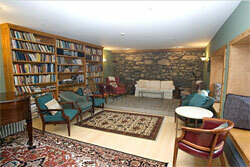 Insulated with recycled newspaper, the thick stone walls keep the room cool in summer and warm in winter. Guests can gather for music around the grand piano or curl up and read in the roomy window seats. This cozy and intimate room adjoining the dining room accommodates up to 25 people. CedarHeart Lodge is a special and multi purpose space featuring a rare and ancient old growth elm tree as a vertical support pillar. 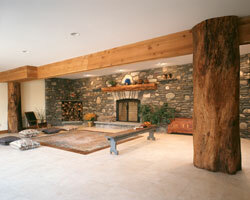 The custom fireplace is at the center of a hand built stone wall utilizing local quartz conglomerate and native bluestone. A hand built walnut "S" bar, reclaimed from a local hunting lodge, tempts guests to rest and relax while looking out to the Catskills and the private stone courtyard which connects to the kitchen. CedarHeart Lodge may be used as a dining hall or break out space and comfortably doubles as a communal sleeping quarters for up to 6 guests with a Â½ bath. Depending on the occasion, CedarHeart Lodge is perfect for 10 to 50 people. 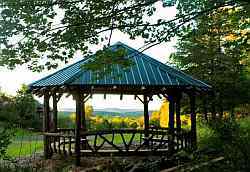 The Pavilion is made entirely of our own cedar and pine wood with a million dollar view of the Catskill Mountains. It comfortably seats up to 25 people and is a short walk from the main Sanctuary building. 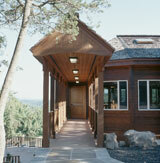 Lifebridge Sanctuary is equipped with handicapped accessibility for every entrance. Within the building, access between each floor is by stairs - there are no elevators. 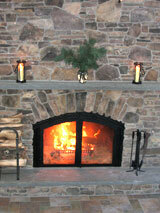 In winter enjoy the natural warmth of blazing fires in the three stone fireplaces.